Tesco own 7-9 Victoria Road but do not appear to want to do anything with the site. They fought for planning permission taking their case to the Planning Inspectorate where they won planning permission for a Tesco Express on 7 April 2009. They have sat on this site letting it rot but at the same time continue to develop other Tesco Express stores in the area. These pictures were taken on Saturday and reflect the current state of the building. Come on Tesco. Either pull it down and build your new Tesco Express or sell the site and let someone else develop it. Show the residents of New Barnet some respect and do the right thing. Word reaches me that Tesco have taken over the old Barnet Marine shop at Greenhill Parade. Having checked the Land Registry database, Tesco have indeed taken a lease on the property. My question to Tesco is why are they developing a new shop when they have been sitting on a derelict property at 7-9 Victoria Road in New Barnet for 10 months but have failed to develop. Tesco refused to accept the judgement of Barnet Council and appealed to the Planning Inspectorate on the Victoria Raod property. With a slick barrister and an expensive team of advisors they managed to win planning consent. You would have expected them to start work pretty quickly, but no, the building continues to be in a dangerous, tumbled down state. 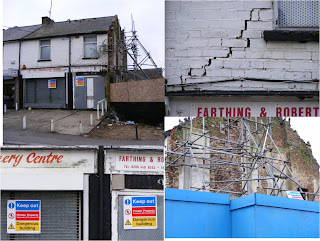 The state of 15 East Barnet Road is an appalling eyesore, which they also own. Tesco are bad neighbours and seem to be oblivious to the continuing blight they are causing in New Barnet.